It took 108 years and some final moments of anxiety, but Chicago finally ended the longest title drought in American team sports with an 8–7 win over the Indians for its first World Series championship since 1908. The drought, as all eventually do, ended with help from above. Rain, glorious cool rain on a strangely warm November evening, fell on -Progressive Field in Cleveland just as the Cubs were about to flush away their 108th consecutive season without a World Series title, in their most harrowing manner yet. The rain fell not in a deluge or in buckets, but in a gentle spray, as if the timer on heaven’s sprinklers had kicked in. It fell with the minimal amount of force necessary to coax umpires into stopping the seventh game of the 112th World Series just after nine innings had been completed in a 6–6 tie. Grounds crew personnel began the choreography of pulling the tarpaulin over the infield. Both teams repaired to their clubhouses to wait out the delay. The last players to leave the Cubs’ dugout were reliever Aroldis Chapman and catcher Willson Contreras. The 28-year-old Chapman throws a baseball harder than any man alive. At 6' 4" and 215 pounds he is, in the words of his manager, Joe Maddon, a mass of “wrapped steel,” and he was weeping. Contreras walked by his side with an arm around Chapman’s broad shoulders. The woeful picture did well to capture the sentiment of Cubs Nation at the moment, a brotherhood of tears and misery. It was Chapman who in the previous inning, with Chicago four outs away from the title and ahead 6–3, had allowed a run-scoring double and a two-run homer to the first two batters he faced, Brandon Guyer and Rajai Davis. The lead and any semblance of optimism Cubs fans can allow themselves dissipated that quickly. The deep, purposeful voice rang out loudly. What happened next is a story that will be told a hundred years from now, just as the oral history of the last century overflowed with tales of Babe Ruth’s called shot, flubbed grounders, pet goats, black cats, deflected foul balls and assorted other misdeeds and pratfalls that defined Cubs baseball. How this story differs from all the others over the previous 107 years is that it ends with Chicago winning the World Series. That’s right: The Chicago Cubs are World Series champions. Shout it from the rooftops of Waveland and Sheffield. The last time anybody spoke such words, Joshua Chamberlain, a hero at the Battle of Gettysburg, was alive. That such a development could be real is amazing enough. But how it happened was nothing short of astonishing. The man with the deep, purposeful voice was Jason Heyward, the $184 million rightfielder who was batting .106 for the postseason after a disappointing year in which he hit .230 with seven home runs. As the players left the first base dugout and went down a corridor that leads to stairs up to the clubhouse, Heyward called them into a long, rectangular weight room off the hallway. Maddon saw them and kept walking back to his office. He rarely has meetings with his players—only about three of them in the past 10 years, he estimates. So the manager didn’t bother to inquire about what was going on in the weight room. Cubs president Theo Epstein met with the manager in his office to confer about their pitching. Maddon had already improvised by inserting Jon Lester into the fifth inning in relief of Kyle Hendricks with Cleveland’s Carlos Santana at first base and two outs. In a pregame strategy session the last thing Epstein and Maddon agreed upon was that Lester, because of his mental block throwing to bases and his limited history of relief work, would enter a game only at the start of an inning. But Maddon abandoned the agreement because he wanted the lefty to face lefthanded-hitting Jason Kipnis. However, Kipnis reached on an infield single that was compounded by a throwing error from catcher David Ross that left Kipnis at second and Santana at third. Lester then bounced a wild pitch that allowed both runners to score—the first such play in a World Series since 1911—to cut the lead to 5–3. Lester, however, recovered to pick up nine outs without further damage. While Epstein met again with Maddon during the rain delay, his phone buzzed with a text. The message instructed him to meet in a suite behind home plate with Peter Woodfork, MLB senior vice president of baseball operations, about the anticipated length of the delay. Epstein walked out of Maddon’s office and down the stairs. As he passed the weight room on his left, however, Epstein suddenly stopped. He saw his entire team—no coaches—so he remained outside and listened. Heyward was leading the meeting. Other players began to speak up. Epstein smiled. Only moments earlier, when Davis had hit his dagger of a home run off Chapman to tie the game with two outs in the eighth, Epstein’s heart sank. Epstein took over the Cubs after a contentious divorce from the Red Sox following the 2011 season. Starting with Chicago’s Instructional League teams that winter, he set about changing the Cubs’ culture so that rather than expecting to lose, members of the organization expected to thrive and win through camaraderie and attention to detail. “That’s so Cub” became shorthand for playing baseball the right way. Overhearing the players-only meeting, Epstein suddenly lost that doomsday feeling Davis’s home run had triggered. “It snapped me back,” he says. “It reminded me of how much I admired them and how tough they are, how connected they’ve stayed with each other, and the great things human beings can accomplish when they set out to achieve for other people, not for themselves. “That’s something that made this organization what it is now. From my -position I can see it: the sacrifice the scouts make when they drive the extra miles to get that last look at a player, the minor league coaches putting in extra hours, the big league coaches crushing video, the players working on their weaknesses, picking their teammates up. That’s what makes a great organization. That’s Cub. The clock approached midnight when the rain began. The delay lasted only 17 minutes, not much longer than the time it took to unroll the tarp and then roll it back up. The timing was crazy. The Cubs and the Indians had combined this year to play more than 400 games, including spring training, and with the score tied after nine innings in the final game of the World Series, they were forced to take a break. It was the ultimate dramatic pause in the telling of a story, perhaps a final wink and nod from the baseball gods before fortune really turned for the Cubs. “A little divine intervention never hurt,” Epstein says. Before heading back to the field, Maddon< sat behind his desk in the visiting manager’s office, the one with two open packages of dark-chocolate bars and an 8 × 10 picture of Hall of Fame Orioles manager Earl Weaver, which served as both inspiration and totem for Maddon throughout the World Series. Then he grabbed a faded -periwinkle-blue Angels cap—the outdated one with a wings logo—and stuffed it into the back of his waistband and underneath his hoodie. The hat belonged to his father, Joe, or as they knew him around Hazelton, Pa., Joe the Plumber. Joseph Anthony Maddon worked 60 years at C. Maddon & Sons Plumbing and Heating, a family business begun in the 1930s by Carmen Maddon, an immigrant from Italy. Five sons followed. Many of the pipes in Hazelton were serviced by the Maddon boys. Three of them, including Joe, who often would be found with a Phillies Cheroot cigar between his teeth, raised families in the apartments above the shop on 11th Street. Maddon and Epstein had already decided that righty Jake Arrieta, who had started and won Game 6 the previous day while throwing 102 pitches, would relieve the weary Chapman in the bottom of the 10th inning. The first batter to come to the plate after the rain delay was Kyle Schwarber, the 23-year-old designated hitter who is the swaggering definition of “That’s so Cub.” Epstein and general manager Jed Hoyer took Schwarber with the fourth pick of the 2014 draft, a choice some experts derided as a reach because Schwarber, a catcher-outfielder, seemed best suited to DH. In the third game this year Schwarber wrecked two ligaments in his left knee when he collided in the outfield with centerfielder Dexter Fowler. Doctors told the Cubs he would be lucky if he could play by the second half of the winter league season. But Schwarber attacked his rehabilitation with gusto and even attended routine scouting report meetings for catchers about how to attack opposing hitters, a practice he continued in the postseason. On Oct. 17, Schwarber flew to Texas for his six-month checkup. He received medical clearance to begin hitting. Eight days later he started Game 1 of the World Series. Schwarber came off six months of inactivity to hit .412 against the Indians. In serving as the DH he learned a routine to get himself sharp between at bats. He would hit off a tee in an indoor cage, then hit off a pitching machine cranked to more than 100 mph. “I want to get myself ready to hit velocity,” he says. Because of the meeting, Schwarber did not hit in the cage before his leadoff at bat in the 10th against righthander Bryan Shaw. On a 93-mph cutter on the second pitch of the at bat, Schwarber rifled a single through the shift against him on the right side. Maddon sent Albert Almora Jr. in to run for Schwarber. The next batter, third baseman Kris Bryant, had been fighting cramps all night. He received treatment on his right arm between innings. His legs throbbed. Bryant blasted a long fly ball that chased Davis to the wall in centerfield where he made the catch so deep that Almora tagged up and advanced to second base. Cleveland manager Terry Francona opted to intentionally walk Rizzo, who was 2 for 2 against Shaw, to pitch to leftfielder Ben Zobrist. When the -Series began Maddon called Zobrist “the perfect protector” for Rizzo, preferring his switch-hitting bat behind Rizzo’s lefthanded stick. Shaw jumped ahead of Zobrist 1 and 2, then threw a nasty inside cutter that Zobrist fouled off in the manner of someone shooing bees. Shaw came back with another cutter, this one away, and Zobrist sliced it down the leftfield line for a double, chasing Almora home. After an intentional walk to shortstop Addison Russell, catcher Miguel Montero knocked in another run with a single, putting the Cubs ahead 8–6. Arrieta no longer was needed for emergency duty. With a lead Maddon gave the ball to Carl Edwards Jr., a 25-year-old 48th-round pick who was, in Epstein’s words, “the third player in a trade” with the Rangers in 2013. Montgomery, 27, had never saved a major league game among his 75 career appearances, postseason included, and here he was being asked to save the title of the century. A July trade acquisition from the Mariners, Montgomery embodies what Epstein and Hoyer seek. “We try to find players just before they are about to pop,” Epstein says. They had been fishing for bigger names on the trade market, but pro scouting director Jared Porter and director of major league scouting Kyle Evans kept pushing for Montgomery. In a year, they told Epstein, he would be a solid four-pitch starter. The Cubs’ World Series roster was chock-full of those about-to-pop acquisitions, including Game 7 starter Hendricks and Rizzo (2012 trades), setup man Hector Rondon (2012 Rule 5 pick), pitchers Arrieta, Edwards, Pedro Strop and Justin Grimm (2013 trades), Russell (2014 trade) and Montgomery (2016 trade). The World Series came down to Montgomery against little-used Michael Martinez, a utility player hitless in three postseason at bats. Martinez tapped a slow roller toward Bryant, whose left foot skidded on the wet grass as he set himself to throw. In any of the previous 107 years, the slip might have caused an errant delivery, extending the inning toward greater infamy and deeper heartbreak. But for the Cubs there are two epochs now: What came before the rain and what came after. Bryant whipped the ball accurately to Rizzo, who squeezed it for the final out. It was a cleansing rain. Maybe the night had to be this dramatic—a midnight passing shower, a seventh game requiring more than nine innings—to end the biggest burden in sports. Maybe the whole Series had to be this dramatic. Chicago fell behind three games to one. Only three teams, and none since the 1979 Pirates, had overcome such a deficit to win the championship on the road. The Cubs trailed 1–0 in Game 5, six innings from elimination. But that’s when Bryant homered and Rizzo doubled on back-to-back pitches, the building blocks to a three-run fourth inning that was just enough to win 3–2, the jump start to the comeback. Before that game, facing elimination, Rizzo stripped down to nothing and shadowboxed around the clubhouse as Rocky played on the TV monitors. “Got to go the distance!” he shouted. He stepped to the plate in the first inning that night to the movie’s theme song. By the time Chicago reached Game 7, Rizzo had an entire pregame lounge act working in the clubhouse. Besides the Rocky pantomime, he sang or quoted inspirational words from movies such as Any Given Sunday, Little Giants, Miracle and Remember the Titans, among others, while the clubhouse stereo blasted AC/DC. 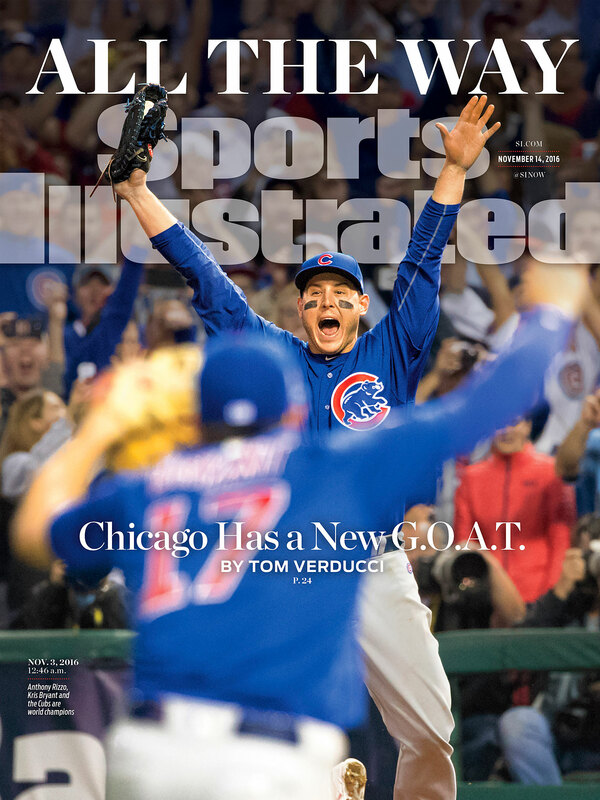 That’s the way the Cubs prepared for and played baseball—with an insouciance that couldn’t be bothered with nonsense about goats and curses. Maybe to be a Cub meant something entirely new this year. How fitting that it was Heyward, a bust as far as the production he returned on the franchise’s investment in him, who pulled the team together in its moment of crisis. Game 7, before the first pitch was thrown, carried the heaviest weight of any World Series game ever played, if only because the two franchises had gone a combined 176 years without winning the title. The next-closest World Series Game 7 with so much unrequited history behind it came in 1975, when the Reds and the Red Sox brought 92 years of waiting into their finale, won by Cincinnati. Once played, this game became even bigger. It will go down as one of the most epic games in baseball history: four hours, 28 minutes of stomach-turning drama—and a 17-minute interlude that changed history. To be a Cub today means something very different than what was commonly known. It was the motivation Maddon brought to the club last year, and reinforced this spring when he adopted Embrace the Target as the team’s motto. “I love tradition,” he said. “I think tradition is worth time mentally, and tradition is worth being upheld, but curses and superstitions are not. “So it’s really great for our entire Cubdom to get beyond that moment and continue to move forward, because now based on the young players we have in this organization, we have an opportunity to be good for a long time, and without any constraints, without any of the negative dialogue. Cubdom, as Maddon would call this nation of the yearning, is transformed. All it took was 108 years, and one of the greatest baseball games ever played.